There is a seismic shift rippling through the entire economy, but it’s difficult to observe because it is invisible. I call this change “vaporized”. When my clients ask me to explain what is happening to consumer electronics devices, fixed media and even retail stores, I tell them that these things — and a great many others — are being vaporized: that is, they’ve been replaced by digital software. The process of dematerialization has been most noticeable in the media and entertainment industries during the past decade. Half a century’s growth was wiped out in less than a decade in the newspaper, magazine, and recording industries as digital software changed the habits of hundreds of millions of consumers. The television industry is going through this process right now. This process is not limited to media and content: even the devices that play digital content have been transformed. Your digital camera, video camera, handheld game consoles, DVD player, voice recorder, GPS unit and about a dozen other devices have all been replaced by an app on your smartphone. The vaporized version is much better than they old physical version: it’s cheaper, easier to use, weightless, customizable and, since it is built into your smartphone, it’s always with you and yet it takes up no extra space. If you don’t like the default app that came with your phone, simply click to download a different one. But media and consumer electronics are just the leading edge of the change. More than one million apps for your smartphone have replaced things that were previously sold as physical products. Today, the process of dematerialization is happening in several fields at once: finance and payment systems, automobile ownership and transportation, labor and manufacturing, health care and medicine. It’s easy to predict that several other fields will be transformed in the near future, including government, the military, the insurance industry and many others. 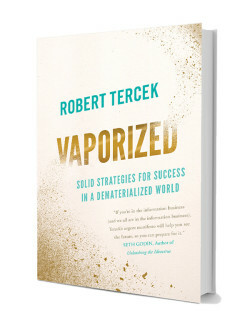 Vaporization is set to transform the entire economy, and with it, consumer society. To gain a better understanding of this process, I wrote a book called “Vaporized: Solid Strategies for Success In A Dematerialized World.” The book will be published in September 2015 by Lifetree Media. You can pre-0rder it now on Amazon. In December 2014, I was invited to give one of the opening keynote speeches at the Turkey Innovation Week exposition in Istanbul. 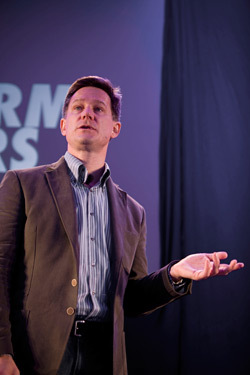 You can watch my keynote speech about Vaporized right here. “Never make forecasts, especially about the future.” Wise advice from Samuel Goldwyn. Which I am now about to ignore at my peril. Here’s my take on what to expect in 2010. During the past 24 hours the Iranian government has attempted to shut down mainstream media, confiscating TV cameras from ABC and other news organizations, in an effort to supress coverage of the aftermath of a disputed Presidential election. Major media has been unable to cover the ongoing demonstrations, street protests and increasingly violent clashes. CNN weekend anchor Don Lemon has been reduced to pulling news from Twitter.